Nebula Collection by Bestar is the ideal solution for organizing small spaces with multiple purposes. With crisp, modern lines, create your dream layout by combining the different units to meet your needs according to the available space. This unit has 2 fixed and 3 adjustable shelves to maximize your options. The reversible door provides closed storage on bottom or upper section of the storage unit. 2 clothing rods are included. Easy to install. Assembly required. 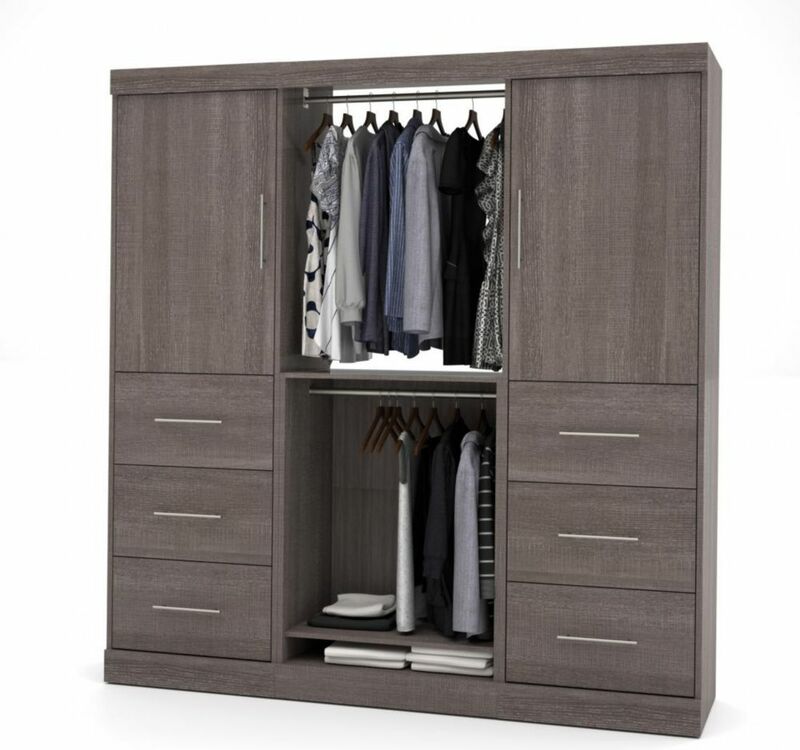 Nebula 80 inch Storage kit with 6 drawers- Bark Gray Nebula Collection by Bestar is the ideal solution for organizing small spaces with multiple purposes. With crisp, modern lines, create your dream layout by combining the different units to meet your needs according to the available space. This kit includes two 25 inch storage units, two doors, two 3-drawer sets, a base unit and a bridge. Each 25 inch Storage unit has 2 fixed and 3 adjustable shelves to maximize your options. The reversible doors provide closed storage on upper section of the storage unit. The base unit has 1 adjustable shelf. 6 clothing rods are included in this kit. Easy to install. Assembly required. Nebula 80 inch Storage kit with 6 drawers- Bark Gray is rated 1.0 out of 5 by 1. Rated 1 out of 5 by Morell teen from Wrong parts included I bought this a while ago for my teenage daughter. She only had it for 2 days and the drawers broke and do not close properly. The doors that are supposed to be on the unit didn’t fit properly and after trying to figure it out and adjusting everything I realized that out of 4 hinges, 3 were the same and one was completely different. Not impressed for the amount we paid we expected a lot better quality.